Historical transportation found only in Victor Harbor. Fleurieu Peninsula: The ONLY place in the WORLD where you can ride a Horse Drawn Tram, a Paddle Steamer and a Steam Train! Here on the southern Fleurieu Peninsula between Victor Harbor and Goolwa we feel incredibly fortunate to live and work in such a beautiful and unique little paradise. Which is why we chose this area for many of our pet friendly holiday homes. There is so much history embedded in towns of the Southern Fleurieu and part of that history has been preserved and kept alive for us to enjoy today. There is something magical about stepping on board a vessel which was created out of necessity over 100 years ago. Life was simpler then, but not always easier. Back then, these modes of transport were just a part of life, but over time, oil and petrol engines have replaced nearly all of these forms of transport. 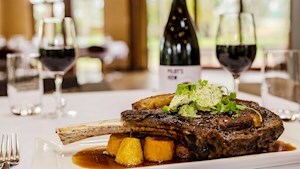 Nowadays, the only place you can step back in time with a ride on a Paddle Steamer, a Steam Train and a Horse Drawn Tram in the one place, is on the beautiful Southern Fleurieu Peninsula. This lovely ‘old lady’ of the river was built in 1908 in Echuca, Victoria and used the box type paddle wheel most commonly seen in Upper Murray Paddle Steamers. The P.S Oscar served the merchants of the Murray, Goulburn and Murrumbidgee rivers quite well until the early 1940’s when faster roads and rail came to prominence. It was also used for a short time as a tourist vessel before the SA Government acquired her to service the ferries along the River Murray. Since 2008, the friends and volunteers of the P.S Oscar W have been offering cruises along the Lower River Murray. You can either sit back and relax, taking in the view where pelicans and sealsare often seen, or if you’re interested in the history and the workings of the P.S Oscar W, you can listen to a brief commentary by one of the volunteers and have all your questions answered. This one hour cruise takes you up to the Barrage just before the Murray Mouth, back under the bridge to Hindmarsh Island and then up river a short distance. The cruise costs $20 per adult with discounts for concession holders, kids and families. Bookings are not essential but are preferred, while special charters and school trips are available for larger groups. For cruising dates and all ticket prices, visit P.S Oscar W.
One of the most unique train rides in Australia, on the oldest steel railed railway in Australia, with some of the best views in Australia, is the enchanting ‘Cockle Train’. The Cockle Train is run by Steamranger Heritage Railway and operates between the historic river port of Goolwa and the seaside resort of Victor Harbor. The area near the Murray mouth is famous for its cockles, and in the old days, people on the southern Fleurieu used to catch the train to this area to collect cockles. This is the legacy that led to the name ‘Cockle Train’. The first railway line was installed between Goolwa and Port Elliot in 1854, and was extended to Port Victor in 1864 when Port Elliot was declared to be an unsafe port. The line north of Goolwa was extended through to Strathalbyn and eventually Adelaide, and by 1884 many Adelaideans would hop on board the train in Adelaide for the much-loved day trip to Victor. Not much has changed in that way, except of course, the mode of transport! The Adelaide line closed in 1980 but the Cockle Train was such an icon that the line from Goolwa to Victor Harbor was spared the axe and Steamranger began tourist operations soon after. Riding the cockle train, you are surrounded by old world charm, wooden panelling, separate booths and lovely old sliding windows to let in the salty sea air and to marvel at the magnificent costal scenery. The carriages are beautifully restored to their original state and it’s hard not to get swept up in the nostalgia of the whole experience. Steamranger Heritage Railway operate the Cockle Train on most weekends, Wednesdays and school holidays, with further details available at Steamranger Heritage Railway. When the name ‘Victor Harbor’ is mentioned, many people automatically think of the Victor Harbor Horse Drawn Tram and Granite Island. It has not only been a Victor Harbor icon but a South Australian icon for over 100 years, and is also recognized internationally! Since 1894, the tram has been a service to the public, transporting locals and tourists from the main land to Granite Island. There was a 30-year gap in its service, from 1956 until 1986, when the Horse Drawn Tram was replaced by various rubber tyred trains. 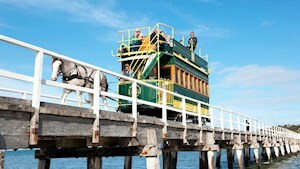 We are proud at Victor Harbor, to house what is probably the only surviving horse drawn tramway in the world. It IS the only all year-round public transport horse drawn operation of its kind in the world and the only recognized horse drawn tram service in the Southern Hemisphere that operates on a continual basis. Now that is special! A ride on the double decker heritage tram is clearly a unique visitor experience and one we should all experience at least once in our lifetime. A regal Clydesdale horse pulls the tram on a track across the 630-metre-long Causeway from the main land to Granite Island and back again 365 days a year. It can take 50 people at a time and carries approximately 180,000 passengers per year! No need to worry about the Clydesdale getting exhausted from all this though, there are 14 Clydesdales who work on a roster and they only work 2 shifts per week. They are very well looked after and very loved by the community, and live on a farm in Victor Harbor. This ride is suitable for all ages and is a simple yet very special experience for the whole family. For ticket information and the timetable visit the Horse Drawn Tram Website. The Victor Harbor Horse Drawn Tram terminal is situated at the start of the Causeway next to the Victor Harbor Visitor Information Centre, opposite Warland Reserve. So, if you are planning a holiday in Victor Harbor or Goolwa and you are thinking of doing some sightseeing on your lazy Saturday or Sunday, why not swap the quiet hum of your modern car for the rustic bump, clunk, toot and shudder of days gone by! Try something no one else in the world can do (unless they visit the Southern Fleurieu) and ride the Historic Trio!